1.) Clean and wash the sago in water. Drain out the water, just leaving a little water so that the sago remains slightly soaked. Set it aside for about 1 hour. 2.) Peel, wash and cut the potato into small pieces. 3.) Mix the sago, groundnut powder and salt well. 4.) In a pan, heat the ghee on a medium flame. When the ghee melts, add the chopped potatoes and stir-fry them till they are cooked. 5.) Add the cumin seeds and chopped green chillies to the potatoes. 6.) Add the sago mixture and gently stir the mixture till all the ingredients are mixed well. Let it cook for sometime. 7.) Place the pan on a tawa and cover it with a lid. Let the sago mixture simmer for 4 – 5 minutes. When the sago is cooked, add the lemon juice and garnish with chopped coriander leaves before serving. When the sago is being cooked, one has to be very careful about the timing. If the sago is undercooked, it will taste gummy in texture. If it is overcooked, the sagos will stick to each other. A proper Sabudhanay ji Khichadi has individual separate sago. 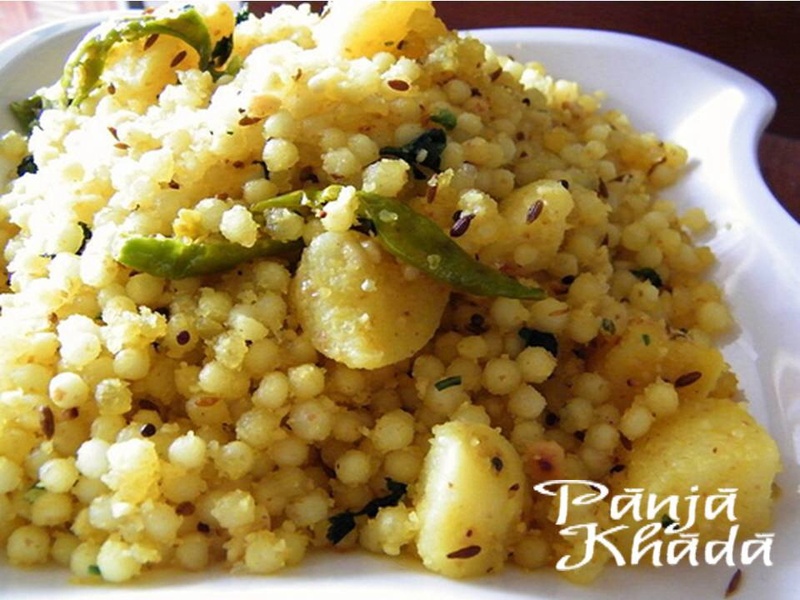 Sabudhanay ji Khichadi is eaten for Lunch and is usually served piping hot with plain curds. It is an Igyas speciality.